According to a recent survey of consumers, clarity trumps everything when it comes to company communications, and that’s very important information for solar marketers. Take a look at this graphic below. Regardless of age and demographic, clearly communicating beats brevity, design, spelling and grammar, and the customer’s ability to interact/comment on the content. This information is so important to solar marketers. Solar is still a new concept to most consumers, and let’s include solar installers as “consumers” too, because new products and innovations come their way all the time, so I think this info applies to all solar sectors. Content is and always will be king. If clarity is most important for communications, then we will continue to need great content to explain how solar works, how it’s financed, and how that new solar widget is different than any other solar widget on the market. And when I say content, I mean blogs, newsletters, videos, webinars, case studies, and e-books. Show examples. Tell stories. Demonstrate. Whatever it takes, take the time and care to create excellent content, and your customers will thank you with sales, trust, and referrals. Engagement matters. 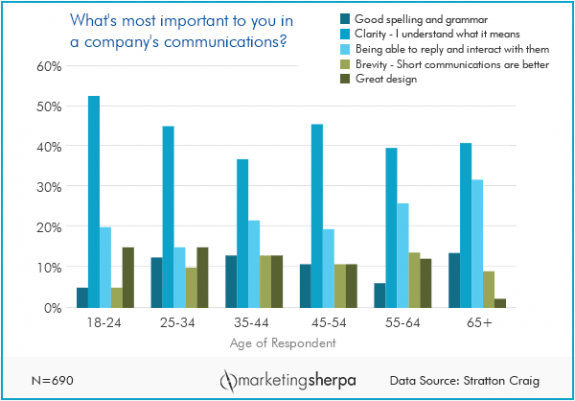 In almost every demographic, the second most important communication element is having a way to engage with the company. That’s especially important for solar, whether we’re talking about installers or residential consumers. People may read your great content, but they’re still going to have questions or feedback about solar or your new product. Not only should you welcome comments, you should make sure that it’s easy for customers to comment. The more difficult you make it for someone to register and log in to comment, the less likely the person will do so. Yes, easier registration may open you to spammers, but there are many apps to filter them, so take that risk and make commenting as simple as possible. Design matters less than you (or I) might think. Quite frankly, I’m surprised that “great design” didn’t have a higher ranking. I’m a firm believer in “You can only make one first impression,” and I know from experience how a new website or an attractive infographic can boost traffic and leads. So, especially with solar, I think great design is more important than these survey results indicate. Solar is complicated, so a nice looking install or product image can at the very least make people stop and read your great, clear content—which is still king. Ideally, design should be part of text-based content, but yes, if for some reason you must choose between great design and key content/text/messaging, go for content and sacrifice a better looking design. Customers will forgive you for typos. Finally, this survey doesn’t give any company a green light to publish content without proofreading, but I think it does say that people care more about what you’re saying than the occasional misspelling or mixing up “its” and “it’s.” Of course, if your content is blah and you make frequent typos, you’ll look unprofessional and lose brand authority, especially if you’re a leading solar company…or trying to look like one. So I hope I’ve been clear here about why clarity is so important for solar communications and marketing. I may have made some typos and I admit that this post’s design is pretty basic, but at least you have a way to engage with me and let me know that or ask a question, right? Right … UnThink Solar.